Keven "AZK" Lariviere and Sam "DaZeD" Marine played their first official game in the past two years. 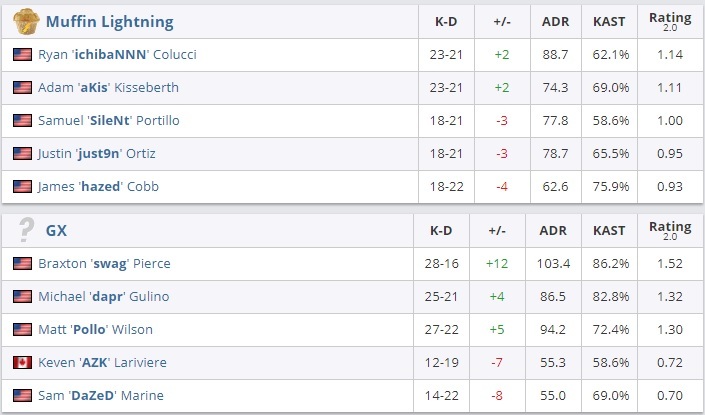 GX won on Mirage 16-13. On July 24th, ESL and ESEA lifted the match-fixing bans placed on players prior February 15th 2015, thus all the ex-iBUYPOWER’s players had the opportunity to compete again in real tournaments. In September, also DreamHack unbanned them. On September 9th, DaZed reunited with his old teammates AZK and Braxton "swag" Pierce and formed GX. They participated in ESEA Premier Season 26 North America and won their first game against Muffin Lighting 16 to 13. The map selected as battleground was Mirage. GX won the pistol round and dominated the opponents up to a 10-1 score The first half ended in their hands, but also Muffin’s CT-side was strong, and they fought back up to 13-16. The best player of the match was swag, who scored 28 kills and inflicted as much as 103.4 damage per round. DaZeD and AZK will require time to get back in optimal shape, but finally they are back! The video of the game is accessible here.